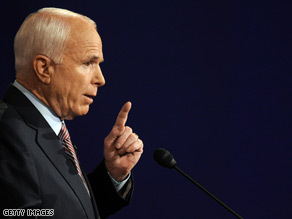 Obama said McCain is proposing $300 billion in tax cuts, but is he?. At their first presidential debate Friday, September 26, in Oxford, Mississippi, Sen. Barack Obama said Sen. John McCain is proposing "$300 billion in tax cuts to some of the wealthiest corporations and individuals in the country." The Obama campaign is basing this assertion on its own calculations using figures from the nonpartisan Tax Policy Center. The center has put forward the most detailed analyses of the candidates' tax plans. The center's director, Len Burman, told CNN his agency has not determined a dollar figure for how much of McCain's tax cuts can be described as going to "the wealthiest corporations and individuals." in addition to the so-called Bush tax cuts. The Obama campaign subtracted from that the amount that the campaign believes the middle class and people at lower incomes may save through the tax exemption McCain is offering for dependents. The total the Obama campaign came up with: just under $3 trillion in new tax cuts over 10 years for the wealthy - which would average just under $300 billion per year. CNN shared the Obama campaign's calculations with Burman of the Tax Policy Center. He said there are problems with the calculations. He said more of McCain's total package of tax cuts would apply to the middle class or people at lower incomes than the Obama campaign is counting. Also, he said, the Obama campaign is choosing to go by the center's analysis of McCain's tax plan as he describes it on the stump, rather than the one McCain campaign officials have provided to the center. In their analyses of both candidates' tax plans, the center has found differences between what the candidates say on the stump and what their officials say. Burman said there is less difference for Obama than there is for McCain. The center's analysis has found that Obama offers larger tax cuts for the middle class and for people at lower incomes while raising taxes for wealthier people, and that McCain offers tax cuts across the board but higher tax cuts for higher income levels. The McCain campaign did not return a call Sunday inviting the campaign to weigh in on the $300 billion figure. Misleading. Obama's assertion is based on calculations using figures from the Tax Policy Center. But the center says more of McCain's tax cuts would go to middle and lower-income Americans than the Obama campaign is counting. The center does not have its own dollar figure for McCain tax cuts that would go to "some of the wealthiest corporations and individuals."